The vibrant colors and textures of Virgil Lampton’s latest work sweep across canvas to viewer with the dramatic turbulence of an approaching storm. Bold hues and varied brush-strokes dance a dynamic frenzy with Lampton’s signature combination of abstract expressionism and traditional American landscape style. Lampton’s creations remain inspired by the elements with this show “Ambulation” especially inspired by the dramatic weather events of the past year. Lampton, Professor Emeritus of the University of Tulsa, earned his Bachelors and Masters of Art degrees from Pittsburg State University and studied at the University of Denver and the Kansas City Art Institute. His work has been exhibited in galleries throughout the United States and is in numerous private collections including the Phillips Collection in the International Building in New York City’s Rockefeller Center and The Upjohn Company in Tokyo Japan. 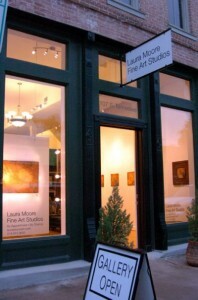 Ambulation was on display through August 8, 2012.